NASA satellites have captured the explosive growth spurt of a baby star. 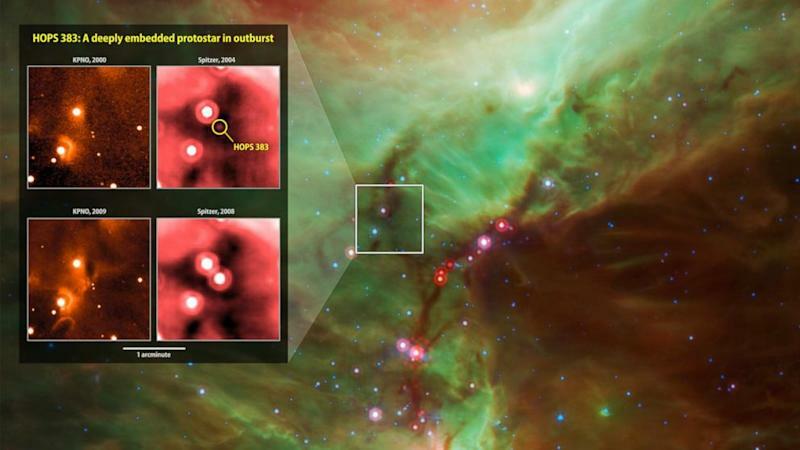 Newborn stars spend about 150,000 years in their infancy nearly invisible to satellite imagery, the protostar -- named HOPS 383 -- lit up in just a few years, according to NASA. Using data from NASA's Wide-field Infrared Survey Explorer satellite, astronomers were able to observe HOPS 383 as it got 35 times brighter from 2006 to 2008. The sudden outburst is believed to be the result of the star collecting more dust and gas. It was first observed by astronomer Emily Safron. It's suspected the prolonged outburst is the result of an accumulation of gas from its surrounding disk. Astronomers believe it's possible that the star then developed an extreme hot spot at the point of impact, causing the disk to heat up and allowing the celestial body to shine even brighter. HOPS 383 is located in the nebula of the constellation Orion around 1,400 light years from Earth -- where plenty of other young stars are still in their birth clouds.